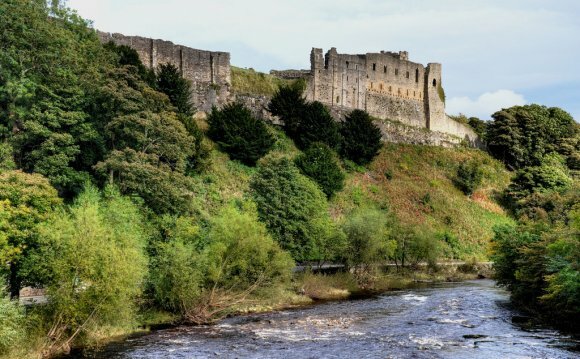 Richmond castle has had a long and varied history, beginning with the Norman invasion in 1066. Located on the eastern edge of the Yorkshire Dales, the castle stands as the centrepeice of the market town that has grown up around it, with a population of nearly 10, 000. After William the Conquerer had taken control of Britain between 1066 and 1069, he gave away large areas of land to some of his most trusted followers. One of these was Alan Rufus, William's nephew, who was given a large estate - the land on which Richmond castle now stands - with the aim of suppressing resistance in Yorkshire and acting as a defence against the Scots and Danes. This estate later became known as the Honour of Richmond, with the name coming from the town of 'Richemonte' in Normandy (anon (a), nd). Alan Rufus was a key figure in the Harrying of the North, and also constructed a castle at nearby Middleham in Wensleydale. Upon his death at the age of 53, his wealth accounted for 7% of the total national income, which in modern day terms is the equivalent of ?83 billion, therefore making him the wealthiest person in Britain's history (Beresford & Rubinstein 2007, cited Narain 2007, n/a). The area of land was carefully chosen so as to make the most of the natural defenses available. It sits high above the River Swale, with a 20m drop to the water below (Fig.1). The river is the second fastest in the country and curves around two sides of the triangular bailey, with more steep slopes adding to the natural defensive elements. In addition to the obvious defensive benefits of the River Swale there were few people living further up Swaledale so it was remarkably unpolluted, providing a constant supply of fresh, clean water. Finally, the site of the castle provides extensive views in all directions, but particularly to the south - where, on a clear day, York can be seen - and east towards the North York Moors. This would obviously be useful for spotting any potential attackers from the more populated Vale of York, a long way off. Work was started on the castle in 1071 and it has stood for almost a thousand years, making it one of the oldest stone castles in the country, along with Durham and Colchester (anon (a), nd). Very little of what can now be seen is actually the original structure, as a lot has been added since, including the Keep itself which was only built in the late 12th century. The archway underneath the Keep, and certain areas of masonry along the east and west walls still remain, but even these features are well disguised amongst more recent additions. The Keep was built by Conan 'the little', who also constructed the barbican, replaced the wooden palisade on the southern flank with a stone wall and fortified the cockpit (Fig. 2). These changes were made in response to increased insecurity and turmoil at the time and were completed by Henry II. In the south eastern corner of the castle are a number of important buildings where the Earl would have spent a lot of his time. These include Scolland's hall (Fig. 3), a two-storey building with a great hall on the first floor which would have been used for banquets. Other sections were added later, such as the kitchen in the 12th century and the Chapel and Great Chamber in the 14th. At this time, a large window was installed at the eastern end of Scolland's Hall, to provide better light to the area where the Earl would have sat.